Trinidad and Tobago’s Law Association has signalled its support of a petition from the Catholic Church to pardon hundreds of remand prisoners who have been in jail without trial for periods exceeding the maximum sentence they would get if found guilty. Armour clarified that his was not a carte blanche support. 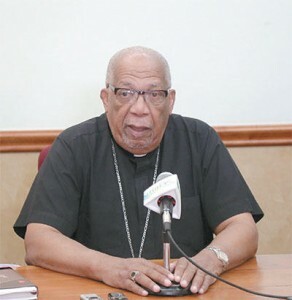 Armour was responding to yesterday’s T&T Guardian lead story which detailed a proposal from Archbishop Joseph Harris, who is asking for a presidential pardon to be given to prisoners charged with minor offences held on remand for a long time. The head of the local Roman Catholic Church proposed the idea of the pardon, which he said is linked to the ‘Jubilee Year of Mercy’ and has sent out letters to priests and parish administrators requesting that parishioners sign forms endorsing the petition and return them by May 26. There are over 2,235 remand prisoners in the nation’s jails and close to 300 could benefit from such a proposal. He recalled that in 1980 he headed a team commissioned by then prime minister Dr Eric Williams to look at the prison system and make recommendations. But head of the Inter Religious Organisation, Brother Harripersad Maharaj, says he is not in favour of the suggestion.